Varetsa Studio specializes in quality art education. We have a variety of offerings to provide the appropriate course for you. We offer basic courses, advanced courses, courses for youths,courses for children and a course specifically designed to help you determine what your special talents and interests are. Whatever your interests—landscapes, portraits, animals, still life—Personal Painting Course will give you the knowledge and skill you need to create paintings that express your ideas and emotions. 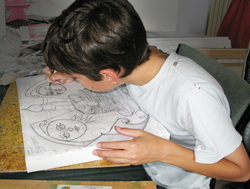 · Varetsa Studio has been successfully helping develop art skills training suited to an individual’s particular needs. You have the opportunity to receive an introduction to many important areas of artistic expression, to discover and develop your skills and form deeper interests.